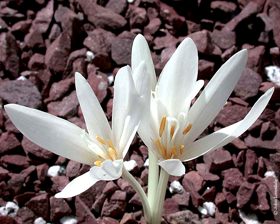 Delicate star shaped white flowers 7cm across 10-15cm long arise in compact clumps without any leaves, in the autumn, and can soon naturalise on a rock garden or even in grass. 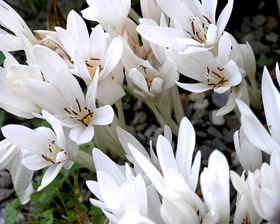 Contrary to its common name, and this is the actual "Autumn Crocus" usually referred to, this beautiful autumn-flowering bulb is not in the slightest related to true crocuses, but is botanically closer to lilies. 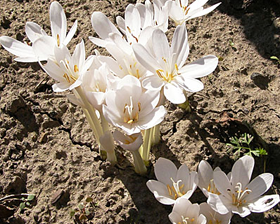 Plants rapidly form large clumps and can display up to 7 flowers from 1 bulb. Sow seeds at any time covering them with compost or grit 5mm deep, keeping the seed pot in a cool, well-lit spot outdoors. Artificial heat is not needed and will sometimes actually prevent germination so be very patient. Many species will only actually germinate in the spring after a good chilling or freezing in the moist seed tray in the winter. Grow on individual seedlings in small pots until they are of sufficient size to be potted on or planted out into the open ground.